Join 3,000+ attendees and more than 320 exhibiting companies from around the world at the largest worldwide gathering of hydro professionals. 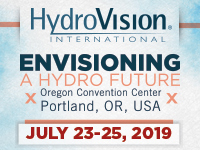 HydroVision International provides a week of informative hydropower focused meetings including perspectives on the role of hydropower and issues affecting hydro resources. For more information visit www.hydroevent.com.